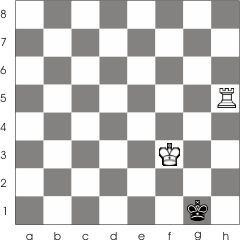 Just like in the case of checkmating with one queen, the rook needs the support of the king in order to checkmate the opponent. 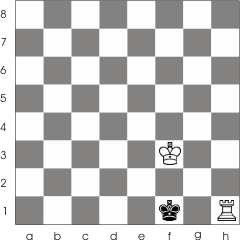 It uses the same principle : the rook reduces the enemy king free space while its king approaches it. 10. Rh5-h8 (This is a waiting move. This kind of moves are made with no specific purpose other then that to wait for the opponent to make his move). 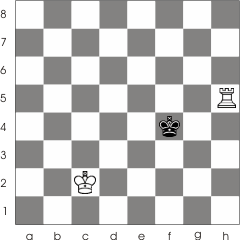 White did this move because Black is in a zugzwang position, and now he is forced to make a bad move. 10... Kg1-f1 And now he entered in opposition 11. 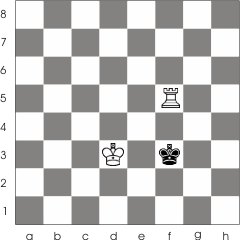 Rh8-h1 Checkmate!